F&B and I made muffins yesterday, two batches which took well over an hour. Little helpers do not make for quick cooking in any way, shape or form. 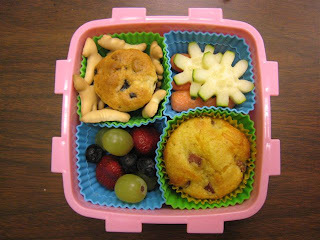 Faith took a corndog muffin, carrot sticks with cucumber flowers, a blueberry muffin, animal crackers, and assorted fruits (strawberries, blueberries and grapes). I was informed after school that she would have liked *two* blueberry muffins.